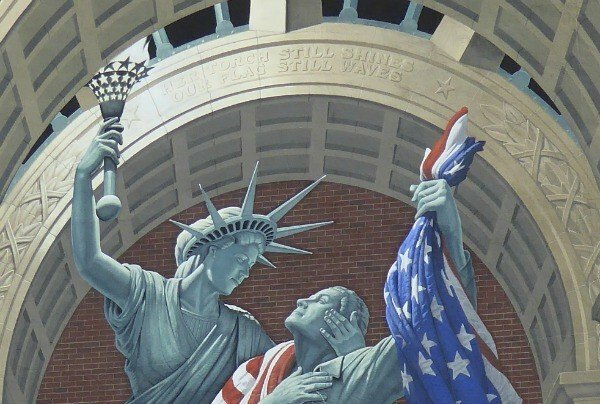 Those passing through Bucyrus, Ohio may notice two Eric Grohe murals, Great American Crossroad on the historic Lincoln Highway and Liberty Remembers, only a block away. 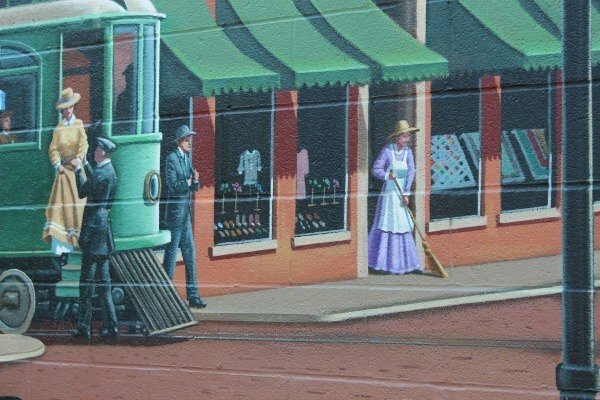 The Bucyrus murals share the history of the community in a vivid display of color. Driving past The Daily Scoop ice cream stand on North Sandusky Street, it would be hard to miss the mural that covers the entire side of an old brick building in Bucyrus, Ohio. I admit this mural had caught my attention on more than one drive through town. But this massive painting by acclaimed artist Eric Grohe is more than just a pretty picture. “Liberty Remembers”, combines art with the rich military history of not only Crawford County but of our country. 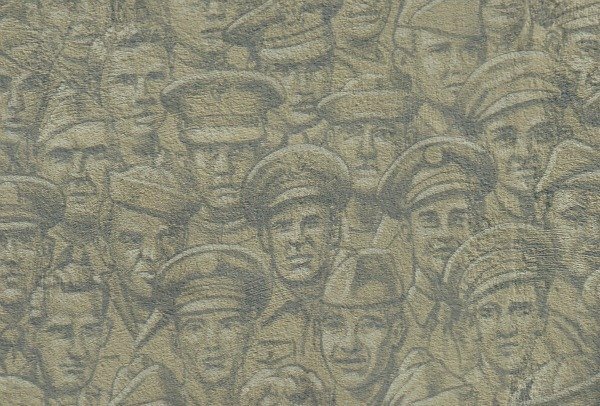 The mural depicts the portraits of 284 Crawford County Veterans that span the Revolutionary War to the Persian Gulf War. Don’t make the mistake of driving by. For a small fee, a guide from the local Visitor’s Center can point out several details that you may miss on your own. Driving by, one would never notice the small horseshoe that represents Frank, a horse that fought alongside his soldier in the Revolutionary War. 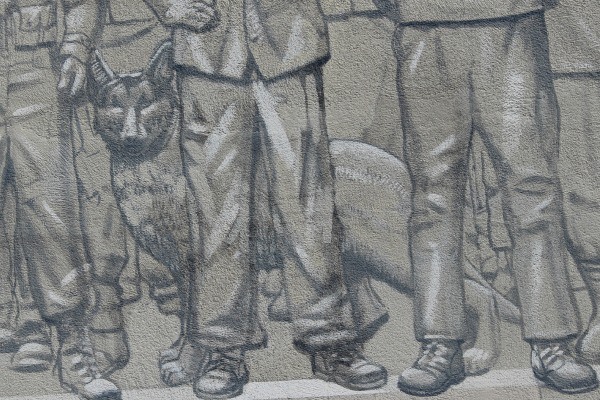 You may not see the dog, Nemo, peering out from behind a row of soldiers at the bottom of the mural. Nemo was a member of the canine corps during Vietnam. He was shot twice and lost an eye, proving that dog really is man’s best friend. His handler lives in the area and stated that Nemo had saved more lives than he did. Work on the mural, showcasing Lady Liberty holding a dying soldier in her arms, began on June 1, 2001, and continued as America faced one of our worst tragedies, 9/11. The artist took ten days off for respect for those who lost their lives on that day. The inscription, “Her torch still shines, our flag still waves”, above Lady Liberty was not in the original sketch, but was added by the artist, a fitting tribute to those who have bravely served and continue to serve, our country. 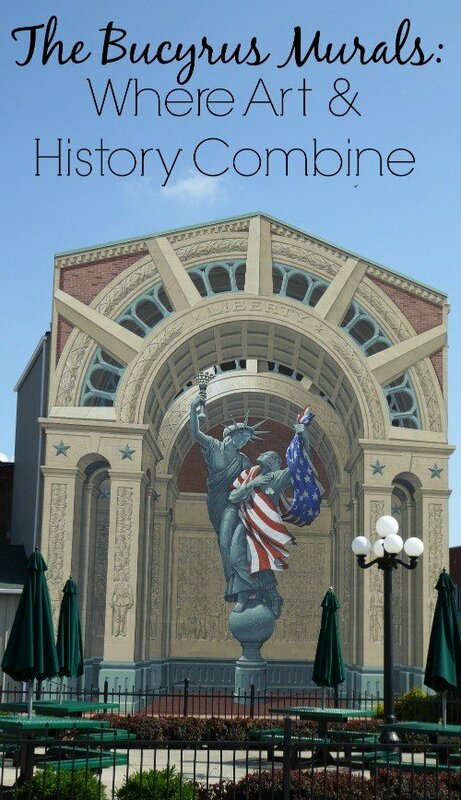 Located about a block from “Liberty Remembers”, you’ll see the “Great Americans Crossroad” mural on the square. 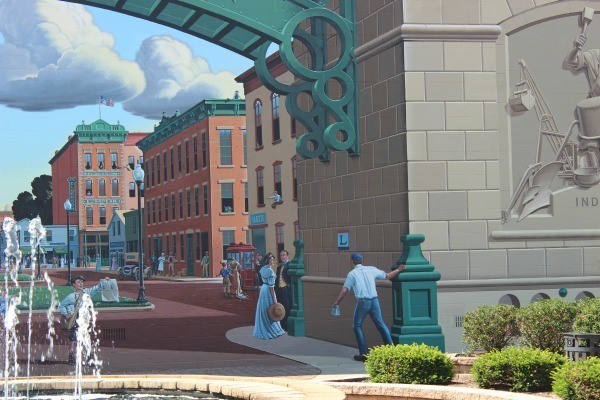 This mural by Eric Grohe represents a bustling downtown Bucyrus in the 19th century. 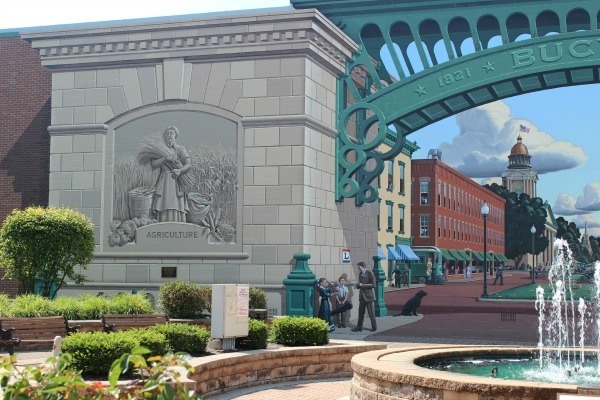 The mural bridges the agriculture history of Bucyrus with the modern Industry. More than 130 local citizens posed to be models in this mural, sharing stories of the past with hope for the future. 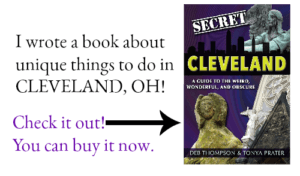 The stories are intriguing and tell of a rich history of the small town that hosted gangsters and influential people like Henry Ford, Thomas Edison and Harvey Firestone who stayed at the Elberson Hotel while attending the funeral of President Harding. Every detail, from the popcorn wagon to the to the quilts in the quilt shop on the square to the woman crying outside the Western Union office, add to the history of this small town. Foxey’s Popcorn Wagon sold popcorn, candy apples and peanuts on the southwest corner of the courthouse lawn for over 60 years! The quilts represent Lois Ide, the wife of a local doctor whose talent for quilt making has resulted in one on display in the Smithsonian Institute. 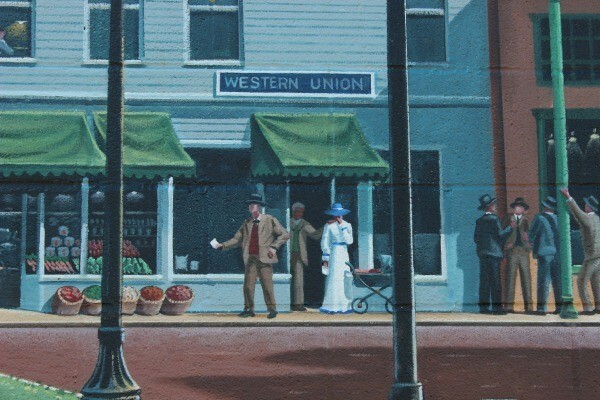 The young woman outside the Western Union building was added after the mural was completed. The artist was deeply moved by the story of Carol Newland who thanked him for putting the Western Union office in the painting. As a pregnant woman, she had received word that her husband was missing during World War II. She was optimistic that her husband would be found alive when after the birth of their child, she returned to a second telegraph where she learned of the death of her husband. The Great American Crossroad Mural not only preserves the local history, it is now the focal point of the park that sits along historic Rt. 30. The fountain and park benches provide a place to sit back and take in the details of the mural while enjoying a coffee or picnic lunch. The park hosts several events, including music in the park on select nights each month during the summer. 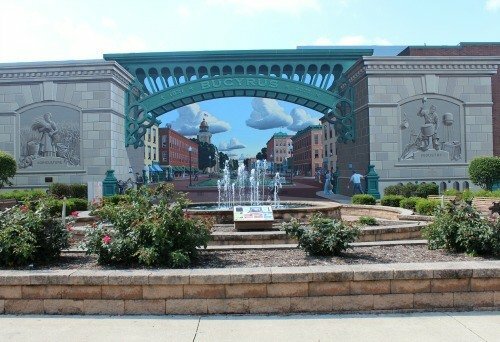 For more information on the Bucyrus murals, or to set up a tour to hear the murals explained in detail, you may contact the Bucyrus Visitor’s Center. 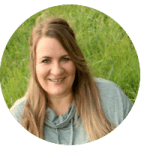 © 2014 – 2018, Tonya Prater. All rights reserved. Oh my, these murals are so moving, Tonya. Just seeing your photos, I can’t imagine how it would feel to actually see them in person. There’s something about the World War ii era. My grandmother’s brothers both served in the war, and that time has always grabbed at my heart. I used to sit and read through her letters back and forth to them and look at the pictures they had sent home from the war. The mural with the woman outside the Western Union office…. wow. Thanks so much for sharing at Inspire Me Wednesday. Featuring you in this week’s issue. Thanks, Mel. They really are stunning. I’ll never look at murals the same way again. Thanks for sharing the meaning behind the mural. I would have enjoyed seeing the pictures anyway, but knowing the stories behind the pictures makes such a difference! The stories behind it really draw you in and give you that connection. I always notice murals but from now on I’ll always want to learn the story behind the pictures. We love a great mural. These are beautiful and show such meaning, art and history. Thanks for sharing them and their stories. Bucyrus is one place we’ve considered visiting in the past…this post give us another reason that thought! Love how a lot of these murals really seem to draw the viewer into the scene. You should visit Bucyrus, Dominique. Have you seen my other posts on this city? I think you’d enjoy pretty much all of the stops that I made. I’d recommend the courthouse, library, D. Picking & Co., Carle’s to grab a bratwurst and Cooper’s Mill. Sounds like a perfect photo to represent your visit to Bucyrus! They look like you could step right into the painting. The murals are incredible. I really felt like I could step inside the Great American Crossroad mural. Ohio really has a lot to offer. I hope you decide to visit one day! I understand, Megan. I also have family members who have served in the military and I have a son who is away for boot camp and tech school right now. The mural really touched me. I really loved hearing the history behind the murals. My photos just don’t do the murals justice. They are gorgeous.